5000USG Hydrochloric Acid Tank Container is used for transport liquid 36% Hydrochloric Acid or dilute sulphuric acid,week sulfuric acid. ISO container suitable for transportation and off shore operation.It is 20FT dimension with container lock,with Acid resistant internal PE lining(plastic)4`` suction line and 4`` discharge and circulating line rolled up to the end of the tank.Can be equipped with Magnetic flap level gauge at the end of the tank,Certified with 5 legs slings (4 legs sling with master sling),With ladder & antic slip steps.Color is gray & farm red. 5000USG Hydrochloric Acid Tank Container plastic manhole and inlet. 20FT dimension with container lock,Acid resistant internal PE lining(plastic).4`` suction line and 4`` discharge and circulating line rolled up to the end of the tank,Magnetic flap level gauge at the end of the tank.Certified with 5 legs slings (4 legs sling with master sling),With ladder & antic slip steps.Color is gray & farm red. Looking for ideal 20FT 5000USG Hydrochloric Acid Tank Container Manufacturer & supplier ? We have a wide selection at great prices to help you get creative. 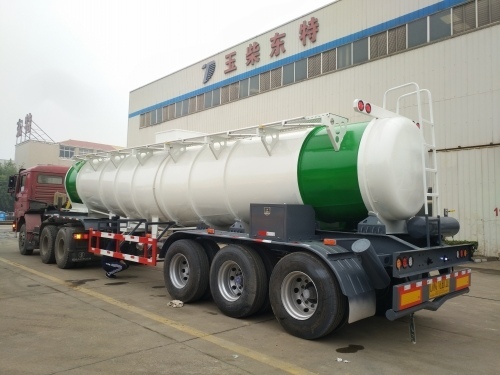 All the Hydrochloric Acid Storage Tanker are quality guaranteed. We are China Origin Factory of Acid Tank Container. If you have any question, please feel free to contact us.